Yesterday we talked about the importance of cultivating the desire within us. Cultivating the desire within us is important because you don’t want to be victims of the change that is imposed on you. You want to be active change makers, active agents of change. That means you have to know what you want to change. A problem we have is that a lot of people don’t know what to change because they’re so used to being changed and they don’t even know “what do I need to change?” Even though they are a lot of changes that are possible, we do not really know what to change. That’s why by cultivating the desire, you know what you need to change, you find out who you are. You find out what you need to do to in order to have a more fulfilling life. You change so that you become truer to yourself, and without knowing what you are and what you want to be, there cannot be any change. That’s why cultivating the desire within us is very, very important. 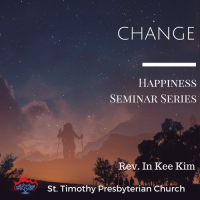 In today’s second lecture on “change,” we are going to talk about the dynamics of change, and change itself in a way. This is a picture I took in Galilee, the Galilee Lake. Change is a journey, not a one time event, even though on the surface it looks like one time event. For example, when you immigrate from Korea to Canada, you pack, you take a plane and you come to Canada. It’s a one time event, it can be done in a day. In the morning you leave, and in the evening or the next day (probably) you’ll get here, it’s a one time event. When you send your kids off to school in different cities, you drive them, you find a room, you drop off some homemade food and then you say goodbye. Right?. Its is a one time event. When your children get married off, you have a wonderful wedding and you let them go. In a day, it can be finished. Even when you send away your loved ones, you have a funeral and you bury them. They are gone from us, so it is a one time event. On the surface it looks like that, but it’s not, its never just a one time event. When we talk about changes, we are not talking about what’s happening on the outside. What’s happening on the outside, what does that do to you as a person? What that does to you as a person is never a one-time event, it lasts a long time. What’s going on inside of us is never just a one time event. It takes a long time for the inner change to take place. What’s happening inside of us is not a mechanical process. What’s happening on the outside is a mechanical process, but what’s happening inside of us is not a mechanical process. It’s complex and takes a long time, everybody is different. How people take what is happening outside differs, everybody is different. Immigration is not just packing up and coming to a different country. When you are in a totally different culture using a different foreign language and eating western food, what you’re going through is much more than just moving to another country. I still remember when I first came to Canada. Whenever I saw an airplane flying in the sky I thought, “Oh my goodness, that airplane must be going to Korea”, even though it was not. I thought “That plane can take me to Korea anywhere, it doesn’t have to be Seoul even though I grew up there. It can be Seoul, Gangwon-do, Shigol. Anywhere is fine, just take me to Korea.” I don’t know how sad I was whenever I was there thinking about Korea, it just saddened me a lot. But after 37 years, I don’t feel that anymore. I look at a plane now, and think “Oh good. It’s noisy. Where are they going?” I don’t feel that sentiment anymore, but it took a long time. It’s been 37 years, and I still remember what I did in Korea, it was beautiful. You could just go to the river naked and swim. It was natural, so everybody was naked, all the boys were naked. We swam and we caught frogs and then all kinds of things. It was a fun memory, but it doesn’t sadden me anymore. It’s now just a nice, good memory. Our inner change does not happen overnight. Now I’m more comfortable here and if people tell me to go in live in Korea, I don’t think I could. I visited Korea about once or twice, but I just wanted to leave as soon as possible. Once my job was done, I just wanted to come back home to Canada because this has become my home. So the real change is not what’s happening outside, the real change is a change of the heart. That’s the second point that I want to make, real change is a change of the heart. So a journey is not the outside journey, but a journey is the inner journey. It is journey of the heart, what’s happening in your heart. So you have to pay attention to the journey of your heart. What is your heart going through in the changes that are happening in your lives? That’s what’s important. You need to be aware of what is happening in your heart. What journey is your heart going through when things happen in your lives. In the story of Emmaus, two disciples were walking on the road to Emmaus after Jesus died. Their journey was going towards the West in the evening, it’s such a beautiful story, beautifully said. So they were walking very slowly like this. They followed Jesus for three years. They gave up everything but now Jesus had died on the cross and although they heard about Jesus’ resurrection, they didn’t really hear it. They thought that all their dreams were gone, so they were walking like this, very slowly towards sunset. On on the road they met Jesus, he was talking to them. They couldn’t even recognize who he was, but somehow when Jesus was talking to them, their hearts were burning. I mean it’s a physical journey just walking on the road to Emmaus, but what was happening? Their hearts were kind of burning hot and then when they got to a place, when Jesus broke the bread, all of a sudden their eyes opened and then they could see Jesus. Until then they couldn’t recognize who he was. So it’s not really what is happening outside, because inside, their hearts were burning and then later their eyes were opened and they were able to see Jesus. So almost like our journey, we go to church or we have been to church all our lives, but at one moment our hearts are burning somehow. We have this burning desire within us and when our eyes start opening little by little and we see Jesus, we meet Jesus. That’s where the heart is. A lot of times we say “I don’t have heart for it.” , or “I don’t feel like it,” but the heart is more than feeling. When you say “Oh, I just feel like doing it.”, it doesn’t mean that your heart is doing it. Cultivating your heart is much more than just feeling for it. You know, having a heart for Jesus is much more than feeling for Jesus. So your heart is not feelings, it’s not emotion. It’s not a place of emotion, but it is a place of everything and is our core existence. A lot of people get emotional about praise and they think they are giving a heart-full worship. No, that’s not heart-full worship, that’s the emotional worship. Heart-full worship is much deeper than that. Heart-full worship is like spiritual worship, so you have to really pay attention to what is going on in your heart. How does your heart react? For example, when you’re fired from a company, how does your heart react? Let’s say you just move, how does your heart react? You have to understand what your heart is doing inside of you. If you make changes without paying attention to what’s going on in your heart, you don’t really change. Yesterday I talked about (back eun neun go)/(pyeon ah eun go) with Bruce a little bit and we talked about the difference between them. You know when, for example, you bought a TV, you want to go and return the TV. (Mo rwa gu rae? Back eun da rae. TV-reul back eun da). That’s physical, but (pyeon ah), you leave milk outside for long time then you don’t say, “Oh milk is (back was seo). Milk is (pyeon eu seo), right? So a more quality change. So, if you make changes without really paying attention to what is going on in your heart, you’ll just (back eu-ing) all the time instead of (pyeon ah-ing). I’m using different language here, right? So what is important is a (pyeon ah), not (back eun neun go). You’re repeating the same thing in different ways. That’s not what changes. You know? Changes you’re making on the surface only become a distraction. We need to see what’s in our heart. One day, a little boy walked along the road and then found a sculptor. He was working with a marble, a bunch of marble. He was cutting it and then all that. After a few days later, he went by again and then he a saw beautiful lion made from marble. And the boy, asked the sculpture. “How did you know that there was a lion in there?” This is a block of marble for the boy, but the sculptor saw a lion in the block of marble. What do you see in your heart that you will cultivate? Will you produce? What you see in your heart, that’s what you’re going to sculpt. If you see an image of God in your heart, then you’ll sculpt the image of God. But if your heart is filled with fear and doubt, then fear and doubt will be sculpted. If we have faith in our heart, trust will be sculpted. If we have arrogance and pride, then condemnation and negative criticism will be sculpt. It doesn’t matter what, whatever you see in your heart will be sculpted. Jesus gave us a parable of different soils. Well, what are four different soils, if you remember from Sunday school? What are those 4? So Simon said, “Path and thorny and rocks.” So these three things. And then good soil of course. So I want you to just turn to your neighbour, three or four. Talk about what is on the “path” and what is a “stone” and what is a “thorny ground?” I want you to discuss it together just briefly, but just turn around with the people around you. Let’s come back together. Let’s first talk about the “path.” What kind of heart is that? “Path.” What kind of heart is that? Hardened? Maybe “rock” is more hardened. Sounds like it. The “path,” what kind of heart is that? It’s kind of indifferent. It’s more than a rocky path. You know, when you hate somebody so much, after that you become indifferent. “I don’t care what you do.” It’s like even with God, almost like indifferent. You don’t really care what God is. You’re not even angry. Like nonexistent. “Hey, hello, I’m here.” But you’re almost nonexistent. This type of heart, what causes that? What causes this indifferent heart? Burnout? Uncultivated? Distracted? Lack of desire? This is almost like a dead heart. It’s there, but its dead. spiritually dead. If you don’t take care of it. That’s what happens to the heart. What we’re talking about is not, “Okay, so this person has a thorny ground and that person has a rocky ground and that person has a path.” No. Within us, we go through all these four stages. It’s not just certain people are rocky and people are thorny. No, we all go through it. If you don’t take care of your heart, you become indifferent. Worship. Bible. God. It doesn’t matter. Your heart becomes very, very indifferent. You need to take care of your heart. That’s why cultivating your heart and cultivating your desire is very important. When you’re indifferent, it is difficult at first. Once it is cultivated, it’s easier, but if you don’t have that, it is very difficult to cultivate that. That’s an indifferent heart. The second, rocky ground is what? A more hardened heart. Either you’re deeply disappointed or angry and something happened that you don’t like. So it is a hardened heart. The third, thorny ground is what? Distraction, basically, a tangled heart. Your heart is so tangled so you don’t even know what you want. At one point you desire god, but at another point, you desire the worst. You’re so tangled, you don’t even know who you are. You really desire worldly success at the same time, you want to be spiritual. All kinds of things are going on in you. You’re so tangled, it’s complicated within you. So the seed cannot grow. You cannot change the heart just like that. It’s not like a light in which you turn the switch on and off. You can’t do that. Either it is growing or not, you cannot just turn it on and off, the heart. So you have to be very careful with your heart. What is going on in your heart is very, very important. When you hold anger for a long time, it becomes hatred in the heart, hatred is formed in your heart. Once hatred is formed, object doesn’t matter. You become angry person. Over little things, you get angry. At first, you began with concrete reason, but once that takes hold of your heart it doesn’t matter, you become an angry person. If you hold greed for a long time, it creates selfishness and corruption in your heart. When you hold insecurities for so long, you become indifferent because you’re so insecure that you don’t want to do anything. You get a lazy attitude. You don’t really care about what happens to you. When you hold judgmental attitude for long time, you become self righteous. Self righteousness is created in the heart. You have to be very careful. You’ll experience all kinds of things anger, selfishness, all kinds of things. That’s okay, but when you hold it too long, then certain negative things are formed in your heart. Then it is very difficult to really change. So the heart is very important. Now let us see what journey our heart goes through when the change happens. In external change, there is an ending and the beginning. The ending comes first and then the beginning follows. If you start a new job, then there has to be an ending to the old job and the beginning of the new job, so the end comes before the beginning. But the change of heart does not happen from ending to beginning, just like that. Our heart cannot go directly from ending to beginning. There is an in-between stage that ends and begins and there is an in-between stage. When we send away our loved ones, just because the funeral is done, you cannot enter into the beginning. The ending is not done yet, the ending lasts much longer. There has to be a period of sending away the person. That’s why we have things like memorial services to have a proper ending so we can go through that in-between stage. Physical separation happened, but the separation did not finish in our hearts. When my mother passed away, for several days my mother kept coming to me in my dreams. In other words, the ending was not properly done yet. Even though the funeral was over still I was going through the mourning period. The ending was not done for me yet. The same happens with breakups, when you end a relationship it takes a long time for your heart to truly end a relationship. Our hearts do not move from the ending to the beginning directly. It has to go through the in-between stage. This is said by a boy, who helps people get to the ferryboat which carries people across the river. He continues saying “To all of them my river has been nothing but a hindrance on their journey. They have traveled for money and business to weddings and on pilgrimages. The river has been in their way and the ferryman was there to take them quickly across the obstacle. However, amongst the thousands, there have been a few, four or five to whom the river was not an obstacle. They have heard it’s voice and listen to it, and the river has become holy to them as it has to me.” It’s a beautiful quote. The transition is not something that you just have to crossover. It’s something that you have to ponder upon. We like to move from one place to another as quickly as possible, like crossing the road. Don’t stay in the middle of the road. Go across as quickly as possible, it’s dangerous. But our change should not be like that. We cannot just move from one place to another, just like that. It’s very easy to do, but without really understanding what your heart is going through, that movement becomes meaningless and also that movement can become hazardous to you too. We should pay attention to the in-between stages. When I look back, many times I have changed without this in-between stage and then later regret it. “Gosh, if I could think a little bit more, if I prayed a little bit more, if I stayed in the in-between state little bit longer,” then the change would have been much smoother. In the inner change, this in-between stage is not just an obstacle. For change, this in-between stage is not an obstacle, it’s a very, very important place. To have a meaningful change, there has to be the proper ending of our past. There has to be a dying process of the old. This is what St Paul said, “In Christ, we are a new creation. Behold, first the old has to go before the new come.” So the old has to go first, the old has gone and the new has come. You cannot have the new wine in the old wine skin. You have to let go of the old for the new to come. The old has to go for the new to come. Charles Du Bos said, “The important thing is this, to be able at any moment to sacrifice what we are for what we could become.” If you don’t sacrifice what you are, then what you could become, can never come. Elizabeth Kubler Ross, in her book, “On Death and Dying” explains how when a person faces death, they don’t just face death. There is a process that they go through, that process first is denial when they have a terminal disease. “No, I don’t have that. The doctors must be wrong, misdiagnosed.” So they go to different doctors, different hospitals to really see whether they have that cancer or whatever. When denial can not be done then what they’re going through is anger. They say “Why is this happening to me?” You get angry, you know? “I’ve done so much for God” and whatever, but you experience that anger and after that begins the bargaining process. “You know, God, if you make me live, then I will do this for you.” Or something like that. When bargaining doesn’t work, depression begins and they go into deep sadness, depression. Then finally, acceptance. Even one single death is that difficult to go through. You don’t just go through from life to death. You go through all these in-between stages to face your own death. Change does not just happen. Just because you made a surface change, that doesn’t mean that you made a real change. You have to go through a proper in-between stage. There has to be a stage in your heart for the real change to take place, so then you have to create a path for the heart to follow. To make change, you have to create a path. You have to learn to see how your heart moves. You need the guidance of the Holy Spirit at that moment when the change has happened, and when you go through the in-between stages, that’s when you need guidance of the Holy Spirit. What is the Holy Spirit speaking to me? For example, when you break up with a person without having a proper ending and if you enter into another relationship, you’ll most likely fail in that new relationship because you never learned from the previous relationship. You never learned about yourself. When the first relationship is over, you have to learn about what do I like about relationships? What do I not like about relationships? What kind of person do I really like, what kind of person do I really not like and what kind of person am I? What is the experience that I really went through with that person? You need to have a proper ending and you need to learn and grow from it in that in-between stage. Without learning, you just go right into the next relationship and it is bound to fail because you’re going to repeat the same mistakes over and over again. When you talk to your parents they mostly talk about their past life. They talk about the Korean war, how they survived and how they came to Canada. Almost like a tape recorder, you know exactly the same order about 100 times a year. Why? The old is stuck there for them. For some other people I meet, they always talk about their university life. They always talk about it, what they did, and their stuff. For some KSM members I talked to, they always talked about their time in the army, saying “When I went to the army…” They continuously talk about that and in other words, that old is still there for them. It’s not completely gone because it was a traumatic experience for them, so it is still there. People say what’s done is done. No, what’s done is never done. What’s done is doing something funny even now, the past is not finished. The past is not determined yet, the past is yet to be determined by our future. For example, if your past mistakes teach you, change you, and make you become a bigger person, then you will remember your past as a beautiful memory and as a worthwhile experience. But if your past mistakes only make you hardened, bitter and you become ruined, because of that, then that past becomes a nightmare, and a painful memory to you. So our past is not determined yet. The past is yet to be determined in your lives, depending on how your future is going to turn out. If you enter into the beginning without the proper ending, you’re ending with linger around you and it will haunt you. You know what the scariest Gwishin (Ghost) in Korea is? Chenyeo Gwishin (Virgin Girl Ghost), “The virgin who died.” They linger around, they haunt you, they never go away. The ending is not properly done yet. So when the ending is not properly done, they still linger on. William Bridges had some very good insight about the ending so I quoted it for you, “The breakdown of the old reality releases energy that has been trapped in the form of our old lives and converse it back into its original state of pure and formless energy. It is recapturing that energy that permits us to be reborn new.” So to be renewed, you need energy and only when that old is gone, that energy is released and then you can use that to start a new life. What should we call the in-between stage? I’ll call it “wilderness.” In the Bible, the second book of the Old Testament is Exodus. Exodus is a book of the in-between stages. The Israelites left Egypt, but they have not arrived in the promise land yet. So the whole book is about them leaving Egypt but they have not arrived yet to The Promised Land, they are in the “wilderness.” That’s the in-between stage. So I’ll call the in-between stage as “wilderness.” Even Jesus, when he ended his 30 years of his personal life before he entered into a new stage of ministry, went to the “wilderness” to be tempted by Satan for 40 days. Saint Paul after meeting Jesus Christ on the road to Damascus before he entered into the actual ministry of Jesus, he went to Arabia. Not necessarily geographically “wilderness,” but spiritually. That was a wilderness for him. You have to stay there long enough to learn everything that you need to learn. Then naturally you enter into the new, but if you just quit it, then you go right back into the “wilderness.” People want to skip the in-between stage and go directly from ending to the beginning, but the wilderness is a place where your heart changes. Your heart is prepared and the energy is created for the new. Our daily life is like that, we cannot finish the day and start the next day immediately. We need in-between stage; that’s sleep. When you sleep, what happens? Your brain still operates, it configures what you saw, what you experienced, and what you heard. During sleep, it configures, so the next day you can start a new day in an organized way. “Wilderness” in Hebrew, is called “mid bar.” It’s strange, it’s interesting. The same word, the word of God or the holy place (sanctuary) has the same root with the word “wilderness.” So in Hebrew, “wilderness,” and the word of God or holy place are the same. Very interesting, their mentality is very interesting. The wilderness is the in-between stage, but it is a holy place where you listen to God. Of course, you may also experience temptation, confusion, difficulties, and loneliness, but you also experience the guidance of God. At this in-between stage you need to experience God deeply. When I left Korea, and when I came to Canada I was 19. In Korea, whatever problems I had, I have lots of friends so I could call them. We would meet, we talk over beer and then the problem was solved and I could move on. But when I first came here, I didn’t have friends. I had nobody, nobody to talk to and I was so lonely. But you know what? At that time, I met God, because I had no human friends around me. I had to talk to God and there I experienced my own spiritual journey. I think the most important place in the course of change is this in-between stage. I think the most important place in the course of change if you want to make meaningful change, the most important place is the in-between stage for all of you. So think about in-between stage. When you’re entering the in-between stage, just pay attention to that a lot and see what your heart is going through in that in-between stage. Depending on how we go through this in-between stage, the quality of our change will be very, very different. If you don’t go through this in between stage very well, then the changes you’re making a will not help you that much, but depending on how well you go through this in-between stage, your change will be a very, very meaningful change. As I said it is easy to decide change. I can always change, but that’s only physical change, but to grow and experience meaningful change, you have to go through this in-between stage very well. Don’t try to shorten this stage, when it is time to move on, you will know it. We talked about St Augustine, in a woman’s Bible study last Wednesday. St Augustine is a saint but he was not always Saint. He loved this woman and his mother, Monica, did not allow her to marry her because her status wasn’t good enough, but he really loved her very much so. But his mother did not let them marry so he had to marry a girl, but she was too young to have a sexual relationship. Since he could not have sexual relations with this woman that he married to, he fooled around. So he had a lot of sexual relationships with others and he was going through a tremendous in-between stage, had lot of struggles, in the “wilderness.” At one point he went to his friend’s house and then the kids were playing. He was sitting and the kids were playing outside. He then heard, “Tolle legit, tolle legit.” That means in Latin, “Pick up and read it. Pick up and read it.” So he looked around and there was a scroll of Romans he picked up and he started reading, saying, “Finish your nightly life and start the new day.” That passage came and just hit him like a rock and at that moment he was completely changed and became a Saint later. So you should not shorten your in-between stage by your new initiative. When the time comes, it will happen. For example, somebody goes, “Oh, I didn’t know want to go to a party and all that.” and at that party you find your soulmate. It’s not just an accident, the time came. You don’t want to come to the retreat and then you came to the retreat and then all of a sudden, you become you a new person. You become ready for change. So, this in-between stage, you don’t finish it by yourself. It just naturally happens and you will come out of it. You don’t even know that you come out of it sometimes. Our reading is not just passing time meaninglessly. Waiting is a very, very good time. In our waiting, life is being created. God is working on us in our waiting, our circumstances do not change us. We did not change ourselves it is God who changes us. For the seed to bear fruit, it has to destroy the shell that surrounds it. In this in-between stage, our shells will be destroyed. Florida Scott Maxwell said this beautiful quote, “Life does not accommodate you. It shatters you. Every seed destroys its container or else there will no fruition.” Beautiful, isn’t it? The shell has to be destroyed and where is the shell destroyed? In the in-between stage. Then the seed will bear fruit. There will be time when you experience this. Just tight in a bud because you’re scared, you’re insecure, whatever. But that is more painful than taking the risk to blossom. That’s when the in-between stage is over, that’s when you enter into the new stage. When you go through the in-between stage, you will experience the renewal. There is pain, but there is joy in being reborn. The in-between stage is where our hearts are molded and shaped through deep reflection, deep understanding, and patient but fervent waiting. Listen to God and experience the presence of God, because if you don’t do any of those, how can you be a new person? Reflection, deep understanding, patient waiting and fervent waiting. This modern world makes me sick. So superficial. Just activities, lot of activities, a lot of surface things. Even movies, I don’t want to watch them anymore. It’s all special effects. No story, no heart, nothing internal. Nothing, no inner journey. This world just makes me so stuffy. We need to get out of it. I don’t want this world to destroy my life. I have a precious life, hopefully at most 150 years. That’s how long I want to live and for most of the 150 years of my precious life I have, I don’t want to live in a stuffy manner. I want to be renewed. I want to live a free, liberated life, and empowered life. I don’t want to just live doing activities and activities. I want my heart to jump with rejoice and with joy. Live day by day with full of meaning. To do that, we have to go through the in-between stage, through reflection, prayer, patient waiting, and then you’ll experience something new in your life. You’ll see the change happening in you. The change happens in the wilderness, cultivate desire, and today we talked about dynamics of change. What is actually happening in the change? So let us pray together. Lord, we thank you for the precious life that you have given to us as we live our lives. We ask you, lord, to truly bless us, bless each and every one of us so that we may be filled with joy, and meaning. In Jesus’ name we pray, Amen.